Solar and Wind Power for Residential -Is Renewable Energy For You? Solar and Wind Power for Residential - Is Renewable Energy For You? It may be termed as a good turn of events that people have at last appreciated the evil effects of fossil fuel generated electricity and are looking for alternative source for generating power. But the story goes back by many years. Looking back to their own history, some Americans thought of using windmills having ‘sails’ measuring 10 or 20 feet that were used by early settlers for crushing grains as probable means of generating current. But the idea was obviously nipped in the bud since installation of such gargantuan edifice on the roof of an urban home proved totally absurd. However, by the end of 1979, Danish engineers developed petite electricity generators fitted with light PVC blades that could produce current when held against strong wind. They called these units “Wind Turbines” which were mass marketed by eminent Danish companies. Taking cue from the Danes, many other British and American companies also started making Turbines that were widely used by people, principally for the sake of reducing their electricity bills as also with a view to inhibiting their dependence on the utility/grid. However, with the passage of time, quite a lot of disadvantages cropped up with the newly developed wind power generated power for which none but the wind was blamed. Inclement weather could put a curb on the wind speed, resulting in abrupt stoppage of generation while the turbines created such a racket when spun at high speed that neighbors were forced to lodge complaints to the local authorities against installation of such ‘roaring monsters’ near their homes. However, use of better bearings and redesigning of the inner mechanism has lessened the noise nuisance to a great extent although some ‘wheezing’ is still there when the turbines are turning at higher rpm. Nevertheless, it did not deter the use of wind power generated electricity although some restrictions were put on their widespread use, particularly in the residential areas. While the wind debacle was in high swing, an accidental invention abruptly altered public attention to a totally different topic. Calvin Fuller, Gerald Pearson and Daryl Chaplin of Bell Laboratories accidentally discovered the mother of modern solar cell in the form of silicon semiconductors during their routine research on the behavior pattern of non-metals. Researchers logically lost no time in developing the cell and were amazed to find that an assembly of solar cells in the form of a solar panel could light up a small home like Aladdin’s magic lamp. Mushrooming enterprises throughout the length and breadth of continentalAmerica were soon found busy making and installing solar panels to whoever asked for it while the state and federal governments offered incentives, grants and rebates for every installation undertaken within the country. The users saw the benefits in the form of reduced electricity bills and hassle-free supply of current that needed no raw material or maintenance as the solar panel had no moving parts at all. But there was a big BUT attached to the system – it could not generate power after the sun went down the Atlantic. 1. 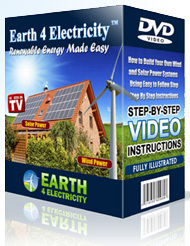 Install both solar panel as well as wind turbine for the home. While the solar system will go on generating power during the daylight hours, the turbine will provide the same at night. 2. Install a battery bank with the system as a stand-by unit to work when everything else fails. 3. Get the system grid-tied so that all surplus current will go to the grid, providing you credit for the power sold to the utility. 4. For an intelligent consumer, making money from the system is breeze. With both units running simultaneously, the consumer will not only need any current from the grid but will also flood it with his or her own generated current. The demand for solar and wind power for residential use has already picked up considerably, and it is expected to do so more in the future. Yes there are still a few technical glitches, but they are almost sure to be overcome and so we can expect to see this becoming more popular.